Treaties, conventions, protocols, and conferences are tools for creating and shaping international law, and for establishing sanctions in the event of noncompliance. A treaty is a compact, or contract, made between or among sovereign nations, involving matters of each country's public interest. It has the force of law within each signing nation. Treaties are the formal conclusion of the negotiating process rather than an intermediate step. Ideally, they include both the formal commitment of nations and mechanisms for enforcement, although many international environmental treaties fall short on the adequacy of enforcement mechanisms. A convention is also an international agreement, although it often has a narrower scope and is less politically motivated than a treaty. In addition, a convention may consist of agreed-upon arrangements that precede a formal treaty or that serve as the basis for an anticipated treaty. A protocol is an agreed-upon document or instrument that provides the template for subsequent diplomatic transactions, serving, in a manner of speaking, as a first draft that is subject to further refinement. 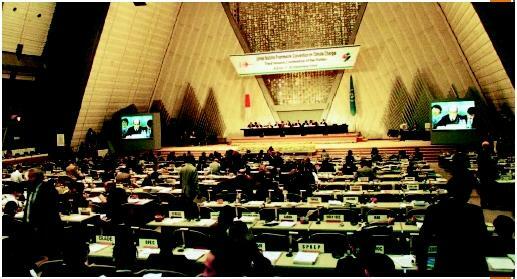 Conferences are diplomatic meetings conducted in order to agree upon policy statements in lieu of formal, and more time-consuming, international negotiations. In addition to such bilateral or even multilateral agreements between nations, international organizations may create mechanisms for examining and resolving international disputes and other issues. Most notably, the United Nations, through its Environmental Programme, and joined by the World Meteorological Organization, was instrumental in establishing the Intergovernmental Panel on Climate Change (IPCC) in 1988. The IPCC created working groups and special committees that assessed the scientific information related to various components of climate change, including, specifically, data regarding the emissions of major greenhouse gases, analyzed that information in environmental and socioeconomic contexts, and then formulated realistic response strategies for the management of climate change. The IPCC's analysis and recommendations thus became the template for subsequent attempts to draft international agreements. The Climate Change Convention, discussed below, was one such result. These various tools and arrangements are unique to international law, which imposes constraints not typically present in national, or "domestic," law. International law has traditionally differed from the domestic law of nation-states in that it is fundamentally voluntary, notwithstanding the fact that political or military pressures may have prompted the parties to negotiate or enter into any compacts in the first place. Hence, ultimate enforcement, short of political or military responses, can be problematic. Photograph by Aizawa Toshiyuki. Hulton/Archive. Reproduced by permission. with respect to its citizens or other residents, it does so by virtue of its internationally recognized sovereign power to coercively regulate within its own boundaries. However, with the possible exception of an evolving European Union, no supranational authority exists to regulate conduct among countries. Thus, treaties and other international agreements historically evolved as a means of controlling the behavior of nations and, by less direct means, their businesses and citizens. These compacts then operate between nations at a level that traditionally was often beyond the realm of domestic regulation. As such, they have traditionally been more akin to contracts, into which countries voluntarily enter, rather than manifest regulatory authority. However, in recent decades, particularly on matters where international environmental law and trade law intersect, there has been an interesting convergence. The distinctions between these contractual remedies that characterize treaties and the enforcement remedies that characterize regulations in which a tribunal issues supposedly binding decisions on disputes, have been merging in interesting ways. For instance, the World Trade Organization (WTO), of which the U.S. is a member, and whose rule the U.S. has agreed to submit, ruled against efforts by the United States to protect dolphins and sea turtles. The WTO decision had included trade sanctions, and found that such unilateral American efforts violated the WTO's free trade rules. Hence, the U.S. was faced with a choice between submitting to this suprasanctional "regulation," supposedly binding, or pursuing conservation-oriented treaty-making that was inconsistent with some of the tenets of free trade. Treaty making extends to all aspects of international dealings. It is most often associated with a declaration of war or the end of an armed conflict, or the allocation of resources between or among countries, with those two broad areas historically related. Interestingly, international environmental treaties and law have usually addressed resource conservation rather than resource exploitation, although, naturally, various parties may seek to maximize their use of resources within the scope of international environmental treaties. In terms of transnational pollution, international sensitivities have evolved that recognize the drastic regional and potentially global impact of uncontrolled or poorly regulated disposal practices. Thus, it is also interesting that although treaties traditionally acknowledged the political and jurisdictional sovereignty of nation-states, present international environmental treaty making effectively underscores the geographic and climate-related commonality of nation-states. Therefore, in an era when globalism is much discussed as an emerging economic paradigm, environmental factors highlight the global consequences of many environmental events and policies formerly viewed through only local or domestic legal prisms. Perhaps as a consequence, treaties and conventions are assuming significantly wider reach, and are entered into, or participated in, by many more numerous parties than was historically typical in international law. Despite concerns about the ultimate effectiveness of international environmental law developed by means of treaties and other agreements, recent history provides the basis for some optimism. As of 2002 approximately 140 multinational agreements on numerous international environmental issues (or including environmental provisions) have been reached. Preliminary studies indicate that notwithstanding weak or even nonexistent enforcement mechanisms, the general trend has been one of compliance. However, it has also been pointed out that nations often enter such agreements when it appears the price of their cooperation will be low, with the result that many such agreements are successfully negotiated by only minimally addressing the particular environmental problems at hand. Modern treaty making has also demonstrated a greater tendency to accommodate equitable goals, although the ability to effectively resolve disputes on the basis of common principles has not been an easy matter. The best treaties, as with contracts, are pragmatic. And, of course, all is not equitable. The usual methods used to influence other parties still prevail. The influence of the United States is a case in point on how national attributes may affect the outcome of international environmental agreements. It is hard to generalize about the direction of U.S. policy. The economic clout of the United States, especially the manner in which American business interests mesh with other national economies, and the sheer dimension of U.S. consumption of the world's resources, continue to influence the outcome of international environmental negotiations. Recent official U.S. policy has demonstrated a reluctance to enter into agreements that would require a significant reduction in resource or energy use by or within the United States. On the other hand, U.S. environmental activists and national policy have often taken the lead in highlighting significant international environmental issues. Nongovernmental organizations, such as Environmental Defense, the Natural Resources Defense Council (NRDC), and the Sierra Club, all headquartered in the United States, not only assert a global presence but often shape both international and U.S. domestic policies. The manner in which the United States formulates its own environmental policies has especially complicated its international role on environmental matters. With power divided between a powerful presidency and a strong but often fragmented legislative branch, with various leaders elected in different regions from different political parties at different times, a balance on domestic issues may be reached, but often at the expense of a coherent and consistent foreign policy. This dynamic, resulting in a diffuse and often contradictory U.S. voice on international environmental issues, still requires some development in the relatively young field of international environmental law. International agreements in recent years have paralleled the recognition of international environmental problems, even if they have not always effectively mitigated those issues. Early examples include the Convention on International Trade in Endangered Species of Wild Fauna and Flora (CITES), which enumerates specific compliance mechanisms and has generally been successful in banning the international trade of endangered species or products derived from such species; the Intergovernmental Conference on the Dumping of Wastes at Sea, also known as the London Dumping Convention, which banned the maritime dumping of radioactive wastes and spurred enactment of the U.S. Ocean Dumping Ban Act; the Convention on Wetlands of International Importance Especially as Waterfowl Habitat, also known as the Ramsar Convention, which addressed the loss of migratory waterfowl habitat. More recent agreements include the Montréal Protocol on Substances That Deplete the Ozone Layer, known generally as the Montréal Protocol, which entails formal compliance mechanisms and has enjoyed significant success in reducing the use of CFCs (chloroflurocarbons) despite the absence of actual sanctions; the 1994 protocol to the 1979 Convention on Long-Range Transboundary Air Pollution on Further Reduction of Sulphur Emissions, known generally as the Sulfur Protocol, largely directed against acid rain, for which compliance provisions have been negotiated; and the previously mentioned Intergovernmental Panel on Climate Change, which matured into the United Nations Framework Convention on Climate Change, effective in 1994, now known as the Climate Change Convention. Other regional and global environmental crises have been addressed under the auspices of the United Nations Commission on Environment and Development, including the Convention on Biological Diversity; the Convention to Combat Desertification in Those Countries Experiencing Serious Drought and/or Desertification; and the Convention on the Prior Informed Consent Procedure for Certain Hazardous Chemicals and Pesticides in International Trade, also known as the Rotterdam Convention. This latter convention sought to transfer the responsibility for regulating hazardous materials trade to exporting nations rather than leaving regulatory control only to importing nations that, for various reasons, might be ineffective regulators. Most recently, the Kyoto Protocol has been the subject of much negotiation and perhaps even greater controversy. An outgrowth of the Climate Change Convention, it seeks the global reduction of greenhouse gases below 1990 levels by targeted dates and provides for an international emissions trading program. The actual reductions proposed are not evenly distributed, and equitable factors have been cited as the justification for the reductions required of, and exemptions afforded to, particular nations. Although the need for an effective mechanism to reduce hydrocarbon emissions as a means of addressing incipient global warming has been widely acknowledged, the best mechanisms for achieving this goal have been sharply debated. The Kyoto Protocol is not yet in force, and the United States is one of several large industrialized nations that have not signed it. SEE ALSO A GENDA 21 ; E ARTH S UMMIT ; L AWS AND R EGULATIONS, I NTERNATIONAL ; M ONTR é AL P ROTOCOL ; NAFTA (N ORTH A MERICAN F REE T RADE A GREEMENT) ; P RECAUTIONARY P RINCIPLE .